The itineraries hereunder are suggestions only for tour operators planning visits to the area and are not booked through Huronia Historical Parks. Arrive at Sainte-Marie among the Hurons and tour Ontario’s first European community with a costumed heritage interpreter. Lunch at the beautiful, fully licensed Restaurant Sainte-Marie ending with a visit to Images of Sainte-Marie museum gift shop for a treasured souvenir. Tour the majestic Martyrs’ Shrine Church, one of Canada’s four national Shrines. Conclude with a visit to Huronia Museum, Huron-Ouendat Village, representing Canada’s beginnings with the life of the Huron people prior to the arrival of the Europeans. Arrive and tour the Wye Marsh Wildlife Centre, one of Canada’s foremost environmental attractions.See the dramatic “Birds of Prey” demonstration then take a stroll and listen to the tranquil sounds of the wetlands. Depart on bus to Downtown Midland for a walking tour of the 30 Historic Murals and then shopping in some of the quaint downtown stores of Midland. Lunch at one of the local restaurants of your choice. Conclude with a cruise aboard the “Miss Midland”, a 300 passenger vessel, and see the 30,000 Islands. Arrive at Penetanguishene Town Dock and board the historic cruising vessel, the “M.S. Georgian Queen”, one of the areas most spacious cruising vessels. Enjoy lunch on board as you take in the majestic scenery of southern Georgian Bay’s 30,000 Islands. Once on dry land, enjoy a tour of Discovery Harbour, one of Ontario’s most picturesque historic attractions. This 19th century historic site will take you back to the days of the British Navy and Military. A stop at Captain Roberts’ Table Restaurant for a light refreshing beverage. Stop in at Chiles Chandlery Gift Shop for that unique nautical souvenir. Arrive and tour Sainte-Marie among the Hurons, a fully constructed 17th century French Jesuit mission to the Huron people. Your tour ends with a wonderful legend told around the story circle in the Longhouse. Lunch awaits you in the beautiful Restaurant Sainte-Marie. Cruise the 30,000 Islands on board one of our great passenger vessels. The“M.S. Georgian Queen” departs from the town dock in Penetanguishene and offers live commentary that is available in French. Lunch at the beautiful, fully licensed Restaurant Sainte-Marie, followed by a visit to Images of Sainte-Marie museum gift shop for a treasured souvenir. Tour the great Canadian historical icon steamship, the S.S. Keewatin, including the Upper deck and the optional lower deck tour of the grain holds, coal bunkers and Scotch Boilers. 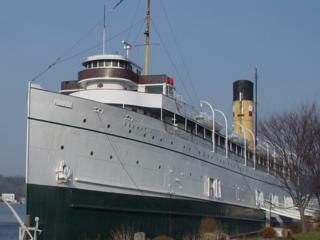 Conclude with a visit to Discovery Harbour for a guided tour of one of Ontario’s most picturesque historic attractions. This 19th century historic site will take you back to the days of the British Navy and Military. Visit the new H.M.S. Tecumseth Centre housing the original 1815 hull of the H.M.S. Tecumseth, plus a new permanent exhibit on the history of the Penetanguishene Naval Establishment and its link to the War of 1812. A stop at Captain Roberts’ Table Restaurant for a light refreshing beverage.